The Myth Of Orpheus And Eurydice was produced for Vogue, and showcases a new Gucci line. Dev Hynes, a.k.a. 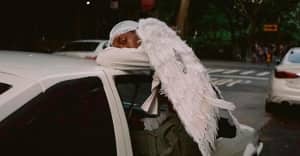 Blood Orange, has collaborated with Gia Coppola for a soundtrack to her new short film The Myth Of Orpheus and Eurydice. It's a four-part retelling of the Greek myth, set in modern day NYC, and was produced for Vogue as a cinematic runway for Gucci's 2016 Pre-Fall collection from Gucci Creative Director Alessandro Michele. In an interview with Vanity Fair, Coppola said the clothes helped inspire her direction. "Alessandro’s symbolism and his ethereal aesthetic convey a story all of their own — an embroidery like the snake on the back of a coat or on a shoe, the butterfly or tiger added extra symbolism and metaphors for me to incorporate into the narrative sub-consciously." Coppola previously worked with Hynes on the soundtrack to her 2013 film Palo Alto, based on the novel by James Franco. She also directed the video for Blood Orange's "You're Not Good Enough."